The “Harry Potter” prequel “Fantastic Beasts: The Crimes of Grindelwald” is a big-budget, holiday-timed blockbuster about ... racism, which may not exactly be the joyful, escapist entertainment families are looking for this time of year. Certainly, J.K. Rowling’s entire literary and cinematic empire is based on a foundation of serious, moralistic themes, explored through an epic, classic battle between good and evil to make them accessible for all ages. Who were the members of Hogwarts’ Slytherin house if not cruel, elitist bigots, obsessed with their perceived superiority as pureblooded wizards and witches? But while the original “Harry Potter” saga achieved a magnificent balance between the heart-pounding and the thought-provoking, the “Fantastic Beasts” spin-off universe still struggles to find such sure footing. 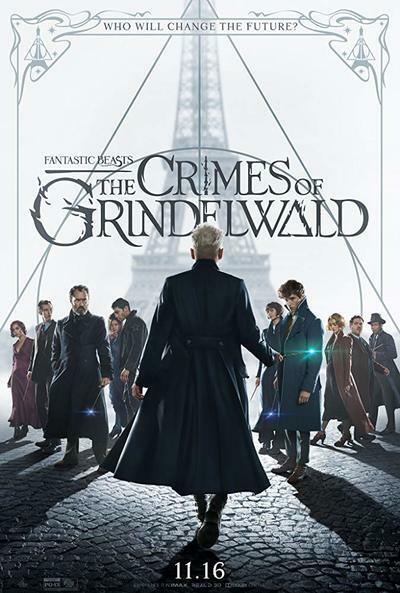 This is perplexing, given that Rowling herself has written the screenplays for both the original “Fantastic Beasts and Where to Find Them” from 2016 and now its follow-up, “Fantastic Beasts: The Crimes of Grindelwald.” David Yates, who directed the last four movies in the “Harry Potter” series, is the director of these films, as well. But it’s almost as if Rowling wants to cram in too much, and no one is willing to suggest reining in that instinct. There’s indeed magic to be found here, as well as visual wonder, but there’s also an unwieldy amount of character and plot. “The Crimes of Grindelwald” is about much more than its predecessor, which was tethered to the fundamental narrative necessities of world building and perhaps relied too heavily on its weird and wonderful creatures to provide the audience with the sensation of being transported, but that's not a good thing. This one, by comparison, is about too much, resulting in storytelling that’s more of a slog than a thrill. Hearing names like Lestrange and paying brief visits to Hogwarts to see a young, dashing Albus Dumbledore can only go so far to rekindle the original magic. And the perennially twitchy, mannered Eddie Redmayne at the center of these films does not provide the most stable, powerful anchor. As Newt Scamander, magizoologist and author of the titular (and fictional) “Fantastic Beasts” tome, Redmayne is all flitty and mumbly, a shtick that’s more distracting than endearing. Although he’s got magic at his fingertips himself, he’s meant to be our conduit into this complicated world. This time, he has his work cut out for him more than ever. The film begins with the dreaded dark wizard Gellert Grindelwald (a frosty Johnny Depp, returning from the end of the previous installment) staging a daring prison escape while being transferred from the United States to England on a dark and stormy night. (This opening sequence is one of the highlights, and it moves with an urgency that the film rarely achieves afterward.) His intention is to gather all the pureblooded wizards from around the world to rise up, take over and rule the non-magical people – No-Majs, as they’re known in America, or Muggles, as they’re called in the British Potterverse. As if the chilling nature of his intentions (and their significance both historically and in the present day) weren’t clear enough, we’re treated later on to the sight of trains, massive blazes and piles of ashes as a terrifying harbinger of what’s to come. It’s not subtle. Depp, however, dials down the whimsical weirdness that marks so much of his work, especially with Tim Burton, and instead finds a stillness and a resonant, villainous depth to his voice. Newt must take time away from his many cuddly and crawly critters to track down Grindelwald at the request of Hogwarts headmaster Dumbledore (Jude Law), who can’t do it himself because he had an enjoyed too intimate a relationship in his youth with this now-evil magician. Rowling has indicated previously that Dumbledore is gay, and the suggested connection with Grindelwald expands on that intriguing notion, but the script frustratingly shies away from delving much further into their possible romance. Newt also has a would-be romance of his own going with the sweet but skittish auror Tina Goldstein (Katherine Waterston, reprising her mousy role). But Tina is apprehensive about getting involved with Newt because she suspects he’s still in love with his childhood classmate Leta Lestrange (Zoe Kravitz), who’s engaged to marry Newt’s brother, Theseus (Callum Turner), who’s an official with the Ministry of Magic. But wait, there’s more. Tina’s pleasingly ditzy sister, Queenie (Alison Sudol), who’s a mind-reader, is back with her lovable lug of a Muggle boyfriend, Jacob (Dan Fogler), ostensibly to help however they can but also to provide some much-needed levity. “The Crimes of Grindelwald” bounces back and forth not only between these various plot but also between 1920s London and Paris, which look so similar in their cosmopolitan gloom that they’re essentially interchangeable (and sometimes even confusing). Finally, one of the most crucial pieces of all is the storyline involving the powerful and tormented Credence Barebone (Ezra Miller), who’s trying to find his true identity while Grindelwald simultaneously tries to find him in order to weaponize him. Credence’s one true friend and protector is the shape shifter Nagini (Claudia Kim), who can turn herself into a giant serpent. But even they get lost in the morass of it all. Individual moments and images do stand out, though: a crowded circus tent that tidily packs itself away into a cart with the flick of a wand, or a gold, sparkly mist that—when sprinkled in a particular place—reveals the exact conversations and actions that took place there, down to the footprints. And the fantastic beasts are indeed fantastic, especially the majestic seahorse made entirely of kelp that you can ride underwater. They’re just a lot harder to find this time.